Vinous readers have come to know that I collect wines for the love of drinking them, meaning I often indulge in vintages that are less obvious choices than those that are more celebrated, but that produced, in some cases, outstanding wines. 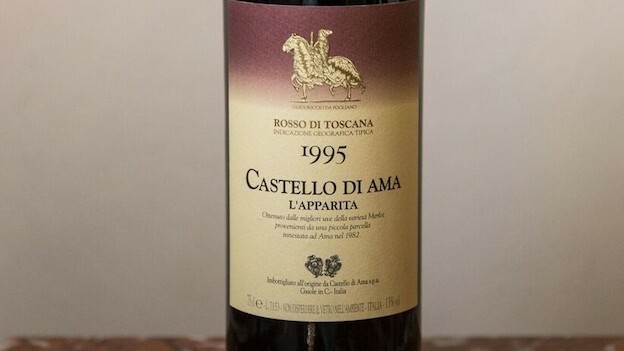 And so it is with Tuscany’s 1995 Castello di Ama Merlot L’Apparita, which is delicious and irresistible, even though it was made in a less heralded year. L’Apparita has been a cult wine ever since its debut in 1985. It’s a 100% Merlot made from grapes that grow at roughly 490 meters above sea level in the estate’s famous Bellavista vineyard (also the source of one of Italy’s greatest Chianti Classico wines). The Merlot (Clone 342) was grafted onto Malvasia Bianca Lunga and Canaiolo Nero grapevines in 1982 and 1985. It’s safe to say this is a decision owners Marco Pallanti and Lorenza Sebaste have never regretted. The 1995 has never been one of the most famous or sought after L’Apparitas, mainly because of the vintage’s so-so reputation. A cool and rainy spring led to a 14 days delay in the growth cycle, and while there were many hot days in July, the months of August and the first part of September were rainy. The vintage was essentially saved by the perfect, unseasonably dry and warm weather of late September and early October. In fact, the 1995 L’Apparita has turned out to be an underrated gem. The grapes were picked on September 25, fermentation saw maximum temperatures of 33-34°C, and maceration lasted roughly 28 days. The wine aged for 14 months in 70% new Allier oak barriques. At 20 years of age and counting, the 1995 is mesmerizingly fresh and vibrant, with a fine grained mouthfeel and very pure and precise blackcurrant, cedar, mineral and coffee aromas and flavors. It is far removed from the very collectible but much richer, thicker L’Apparita wines of 1990 and 1997, for example. The 1995 is almost as great, showcasing a gentler, more refined manner of being. 93/Drinking Window: 2017-2025.